There have been a lot of changes that have taken place with apprenticeships over the past year. We have put together the information that directly affects you regarding the changes that have taken place and we invite you to get in touch with us for further clarity or if you feel you would like to speak to us about the changes. The government have introduced an apprenticeship levy that came in to play on 6th April 2017. The apprenticeship levy requires all employers with an annual pay bill in excess of £3m to invest in apprenticeships. The levy amount is calculated at 0.5% of the employer pay bill however each employer will receive a £15,000 offset allowance each year therefore only employers with a pay bill in excess of £3m will pay into the levy. Money that is paid into the apprenticeship levy will transfer to a digital account that is provided through the Apprenticeship Service. Employers will need to register to create an account and link it to PAYE schemes. The Government will top up these funds by 10%, therefore for every £1 invested employers will have £1.10 for apprenticeship training and assessment. You can purchase apprenticeship training and assessment through an approved provider (such as TSP Learn). Funds can only be used for apprenticeship training and assessment and cannot pay for wages, travel or subsidiary costs, management costs, work placements, traineeships or the costs of setting up an apprenticeship programme. Employers will have 24 months to spend their funds (vouchers) before they expire. Your digital account will let you know when funds are due to expire. Employers who have utilised their levy and wish to train further apprentices will receive a 90% contribution from the government with the employer paying the remaining 10%. 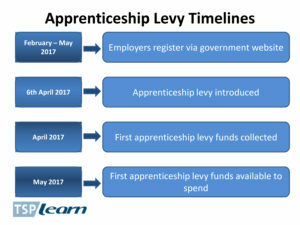 Employers who are not paying into the levy will co-invest in apprenticeships. The government will contribute 90% of the training with the employer contributing the remaining 10%. The government will fund the apprenticeship training of 16 – 18 year olds for employers with less than 50 employees. Additional funding will also be provided to all employers who take on 16 – 18 year old apprentices. Apprentices who started their programme before April 2017 will be funded for the duration of the programme under their existing terms and conditions. The levy and co-investment funding routes can be used to train both existing employees or new employees of virtually any age as long as they are at least 16 years old. We hope that this information has been helpful for you. If you have any questions or concerns, please do get in touch with us. 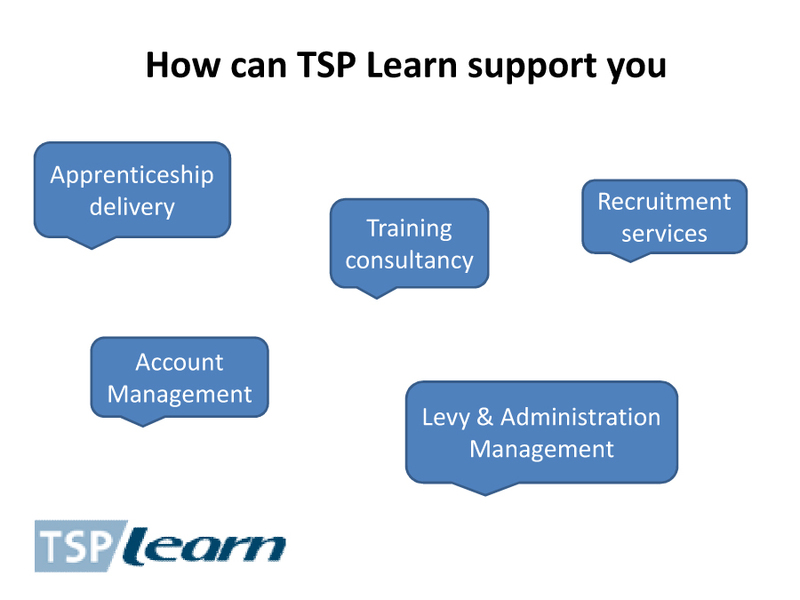 How can TSP Learn support you?